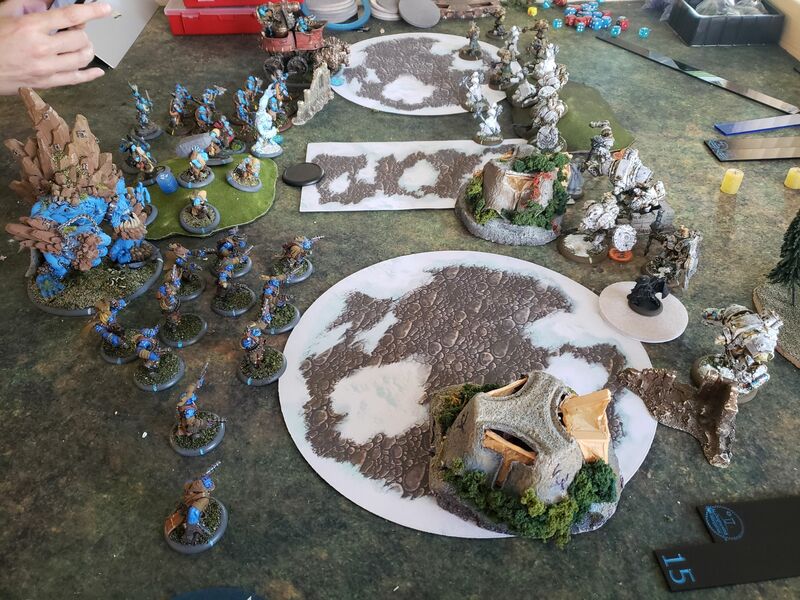 I convinced my wife to play a little Warmahordes with me. This will be the first game of the year for both of us. Rather than field her unpainted Circle, she picked up my fully painted Trollbloods. I’ve mostly got the Crucible painted up, and decided to give Locke a try. Deployment for the both of us was straightforward. She got to go first, which might be okay for my list. The Crucible Guard army gets an extra 2” of deployment. The trolls unfortunately don’t get any, and they are all stuck with only 7” to play with. That means they have a hard time messing around with huge base models. The +1 to their starting roll is usually a good thing with a ranged army, but Trollbloods don’t have a whole lot of range. The longest shot in this list is 12” and everyone else save the Mountain King has a measly 8” range. Thankfully, Grissel can speed up her army, which makes her viable in the much maligned Kriel Company (highly regarded as the worst Trollblood theme in the game). Grissel also has a few other tools that help the army, and the army has a few things that complement Grissel’s playstyle, and it’s probably worth discussing the list in more detail after walking through the battle. Most of the army runs as fast as they can. The Krielstone Bearer takes its time, awakening the stone (for 3 fury!) and the stone is warped for protection against continuous effects. Grissel puts Hoof It on the Wagon, and fills up the stone and casts Guardian Protector. Locke puts up Road to War and drops Redline on a warjack. The whole army runs up. Running on turn 1? Madness! A lot of work actually gets done, although only Gorman and two Assault Troopers die this round. Stone powers up and warps for continuous effects again. The wagon is told to hoof it, and gets Boundless Charge. A rift is thrown out, and deviates toward the wall. Boomhowler uses Cacophony and advances so that Boomy himself is within 8” of Locke. Winter troll uses its animus, and sprays, scoring critical hits on both Toro warjacks behind white Assault Trooper E. The War Wagon charges (+2” of movement makes this thing an actual threat), and kills two troopers, slamming one into another, and then knocking down the two stationary Toros and another Assault Trooper. Highwaymen clear a path for the Mountain King, and do some shooting in the circle, but one dies to a Toro countercharge. The countercharge was a mistake, allowing the Mountain King to charge and throwing a spray through the Toro on the far left, boosting to hit Gorman in the process. The War Wagon drops back behind the wall and just inside the right-hand zone. Trolls wrecking things and knocking things down, as trolls do. The stationary, knocked down jacks take two focus off Locke in order to shake and stand. How annoying. Assault troopers flood the zone. One gets close to the wagon in hopes of tying it up. Two boomhowlers die to hammers. Nobody gets set on fire, since the stone was doing its thing. Little Alyce throws a grenade and a Boomhowler grunt toughs it out. Boomhowler dies to a Toro. I try to set up for some counter charging on the next turn. Locke moves onto the hill, and the Vindicator lobs a shot onto the wagon, not doing hardly any damage. Liberator gets into combat, Toro charges the king, and the Suppressor takes out some highwaymen. Locke uses the Liberator to get a couple more hits onto the Mountain King. Tons of whelps pour out of his wounds. An attempt at some defensive play by the Crucible Guard. Grissel feats, hands out the extra attack to the Mountain King, Hoof it to the wagon, and Cacophony. The Boomy grunts get a +2 MAT from the Fell Caller. The wagon takes down some more troopers. The King takes out Toro, Suppressor with help from some highwaymen. Liberator takes some damage, but hangs together somehow. Boomy’s crew take down little Alyce, who morphs into her big bad self. One of the Toros go down nearby. Nobody scores. Big Bad Alyce makes an appearance. Assault Troopers pick themselves up and move around, clearing a path to the Wagon for a Vindicator. The Vindicator smashes into the War Wagon. One of the troopers not knocked down makes a move on a Boomy grunt. Alyce finishes off the other. The zone is clear, so I will be first to score. The Toro in the rectangle tries to do some damage, but fails to connect. I think its shield arm is malfunctioning. Locke feats. Things aren’t going well… did I forget some rules? Braylen takes some opening shots on the Liberator. The Krielstone warps for strength. The highwaymen flood their circle zone. The King moves into the rectangle and kills the Toro, barely being within 2 inches. It takes the Kill Shot spray, doing some damage to the objective. Grissel lands Calamity on Locke, and hands out an extra attack to the Boomhowler troops. They charge, and team up on Locke, killing her despite the extra armor from her feat. Were there dice spikes? Or are Boomhowler Grunts really this good? I played this very wrong. Locke needed to feat earlier. I could have divided the Assault troopers up, so they could each take a zone, but I think they just would have died to the Mountain King. So I probably played that part well. Locke might have been better off fading back, and maybe to the right zone. She could have used Sentry on the Vindicator. I forgot about that spell. And Redline should have gone on the Toro attacking the Mountain King. If I hadn’t allocated to the Toros in front of lock, the one at the King might have killed it in a single turn. From the Trollblood angle, she played this well. We did do some take-backs and threw in a redo here and there, but it was still a good game. I think it’s important to learn how other armies work, and she’ll be able to take what she learned with her when she plays her Circle army into Trolls in the future. I think she should have moved the wagon back to its wall instead of to the right, but we originally didn’t account for Redline when we measured out the Vindicator’s threat. Now for some list analysis. I’ll start with Trolls, since I’m more familiar with them, and I don’t feel like I’m stumbling through list creation with them. The wagon having “Hoof It” is far better than reposition. It allows for a full move and no free strikes. So it can charge in, smash and blast, then retreat. It’s heavy hitting gun wasn’t doing a whole lot of blast damage (thanks, carapace), but it did smash the single target and knock things over. That’s super important in this matchup. When the troops fall down, there isn’t much they can do afterward. It’s pie plate can be really effective hitting jacks and knocking down high def dudes nearby in other lists as well. Boomhowler gets a lot of flack, but he does what he does well. I had to kill him, and it wasn’t done trivially. If I didn’t, then I wasn’t casting spells or using my Liberator. His troops are still melee-oriented CMA dudes. They aren’t as cheap as Kriel Warriors, but still do some work, and have guns that occasionally hit things. They’re best shooting knocked down stuff, which is everywhere in this game. If it wasn’t for the CMA, they wouldn’t have been able to handle Locke. And Grissel’s extra attack meant the CMA was going to work more than once. I can’t say enough about the Mountain King. Kill Shot is awesome when combined with Assaulting charges. It doesn’t have the 4” reach that the Sea King does, but it rocks a deafening roar, and being able to hand out Rage to a Winter Troll means a puny light warbeast is doing tons more damage to heavy warjacks than it should. With Calamity and Rage, the winter was hitting a Toro with effective POW 17. Highwaymen did well. They took a zone with the Mountain King’s help and Braylen made them really lay into the warjacks. The Crucible Guard felt like I had the wrong pieces in play. I think Locke would really like a Vulcan. Against trolls, I really want to take the artillery. The Assault Troopers could use some help, so they might work better with Syvestro. Locke pretty much ignores her troops. I think she would rather be supported by her troops. So next time, I’ll swap out the Assault Troopers for maybe a jack, and definitely the 3 free units of alchemists. If I can’t ready a Vulcan before my next game with Locke, then I’ll slide in some retaliators. I think they’re fun. It will be nice to lay down some anti-tough tech on the trolls. I don’t know if my wife will be playing trolls again in the near future. I also don’t know if I’ll get another game in this spring. It feels like life has gotten in the way of hobby time. I really can’t understate how excited I am to play the Crucible Guard though. They’re army is pretty freaking cool!